Noah Cyrus is the busiest woman in pop. When she's not churning out amazing singles of her own, she's lending her voice to a plethora of club collaborations or duetting with rock stars. Stepping out from under her sister's considerable shadow, icon-in-the-making Noah Cyrus is proving herself to be a force to be reckoned with in the pop world. The streetwise young songstress launched her career in 2016 with infectious pop ballad 'Make Me (Cry)' and is capitalising on this early success with the fully-fledged The Good Cry Tour this fall, followed by the hotly anticipated release of her debut album 'NC-17'. Shying away from the polished Disney pop veneer of Miley Cyrus' early music, Noah sings from the heart, unafraid to explore the darker side of her emotions and give them life in slickly-produced, teen angst anthems that sing of heartbreak and rebellion whilst also being able to spawn dance floor-filling remixes. Her latest collaboration with Danish singer songwriter MO, the fittingly titled 'We Are F---ed" is a searing examination of social media-centric youth culture and its relationship with a world gone awry. Sound good to you? Share this page on social media and let your friends know about Noah Cyrus at Granada Theater. Please note: The term Granada Theater and/or Noah Cyrus as well as all associated graphics, logos, and/or other trademarks, tradenames or copyrights are the property of the Granada Theater and/or Noah Cyrus and are used herein for factual descriptive purposes only. 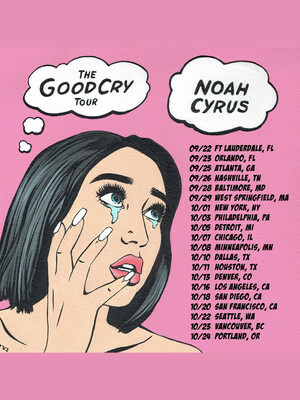 We are in no way associated with or authorized by the Granada Theater and/or Noah Cyrus and neither that entity nor any of its affiliates have licensed or endorsed us to sell tickets, goods and or services in conjunction with their events.